CV/0 deleted Graduate in law (1978); specialisation in administrative law (1978-1979); qualification for court work (1980); magistrate (1981). CV/1 deleted Chairman of the 'Italia dei Valori' party (since 1998). CV/3 deleted Minister of Public Works in the 12th legislature (1996). CV/4 deleted Member of the European Parliament (since 1999); Chairman of the delegation for relations with South America and Mercosur (1999-2002), Chairman of the Delegation for relations with Central Asia - Kazakhstan, Kirghizistan, Uzbekistan, Tajikistan, Turkmenistan and Mongolia (2002-2004). CV/5 deleted Honorary degree from the University of Thrace (Greece). Graduate in law (1978); specialisation in administrative law (1978-1979); qualification for court work (1980); magistrate (1981). Chairman of the 'Italia dei Valori' party (since 1998). Minister of Public Works in the 12th legislature (1996). 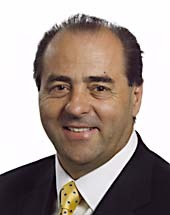 Member of the European Parliament (since 1999); Chairman of the delegation for relations with South America and Mercosur (1999-2002), Chairman of the Delegation for relations with Central Asia - Kazakhstan, Kirghizistan, Uzbekistan, Tajikistan, Turkmenistan and Mongolia (2002-2004). Honorary degree from the University of Thrace (Greece).